Now you can book for 3 nights in oyo rooms in payment for just 2 nights under Redbus Oyo Hotels offer , valid in bangalore, chennai, hyderabad & Pune for 03 sept 2015. 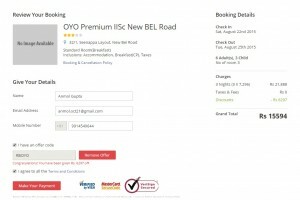 Redbus and oyo both are offering an exciting deal on booking of rooms in hotel. You can book for 3 nights in oyo rooms in payment for just 2 nights under Redbus Oyo Hotels offer . This is an exciting deal to spend nights in vacations at cheapest prices. Oyo rooms are known for their best quality & service in budget prices. Applicable on selected Oyo Hotels in bangalore, chennai, hyderabad & Pune. The offer will be valid till 03 september 2015. All redbus bus customers with a valid M/Eticket can avail complimentary early check in/ late check out subject to availability at the hotel. 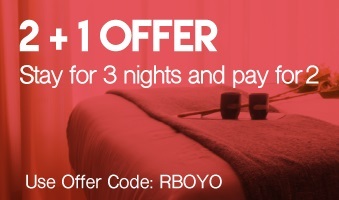 Promo Code : RBOYO (apply this promo code while booking of rooms at oyo). Visit here to book rooms at discount !